​Jacqueline Doyle’s flash fiction collection The Missing Girl (winner of the Black River Chapbook Competition) was published by Black Lawrence Press in fall 2017. She has published creative nonfiction, fiction, and flash in literary journals such as The Gettysburg Review, Southern Humanities Review, Quarter After Eight, [PANK], Sweet, Monkeybicycle, matchbook, The Pinch, Wigleaf, Catamaran Literary Reader, NOR: New Ohio Review, Hotel Amerika, Post Road, Juked, and The Collagist. Her work has earned six Pushcart nominations, four Best of the Net nominations, and numerous prizes (including first place in Midway Journal's 2017 flash contest, judged by Michael Martone). 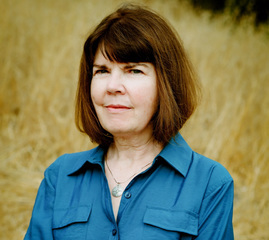 Two of her flash were awarded Finalist listings in Best Small Fictions 2018 and four of her essays were awarded Notable Essay citations, in Best American Essays 2013, 2015, 2017, and 2018. ​After growing up in a New Jersey suburb of New York City, she moved to Ann Arbor for college, then Providence, where she completed her BA at Brown. She lived in Ireland for a year, Germany for three years, and New York City for several years before moving to upstate New York, where she earned her PhD at Cornell. She now lives in the San Francisco Bay Area with her husband, the writer Stephen D. Gutierrez, and their son Ben. She and Steve are both English professors at Cal State East Bay. Winner, “Picture Worth 500 Words Contest,"
Dan Wickett, "Mini-Interview with Jacqueline Doyle,"
Tommy Dean, "Mini-Interview: Jacqueline Doyle,"
Al Kratz, The Missing Girl as one of the "Best Books of 2017: Staff Picks"
Jacqueline Doyle and Stephen D. Gutierrez, “On Collaboration and ‘Imaginary Friends,'"
on "Nineteen Ways of Looking at an Essay,"